Ponies all over the place today. It was announced I do believe a month ago that McDonalds over in Germany was holding a naming contest for a new chicken sandwich. After the votes and dust settled, the burger is now dubbed “The Scootaloo”. “I was in a Skype conversation with German Bronies. Then I noticed a post on Facebook, my neighbor made a burger at “Mein Burger by McDonalds”, he told me to “Click on Like!”. After that I asked the other ones on Skype “Hey, wanna create one, too?” Then everyone said: “YEAH! DO IT!”. Just Scootaloo, because it’s a character from the show. And here it is!” – Sebastian W.
YouTube video on the contest found here. In other news, it seems Pinkie Pie in Godzilla form showed up on the NASDAQ billboard in Times Square. It seems ponies are everywhere now. Thank you for sharing Anon. I also checked out the german site and I confirm this. 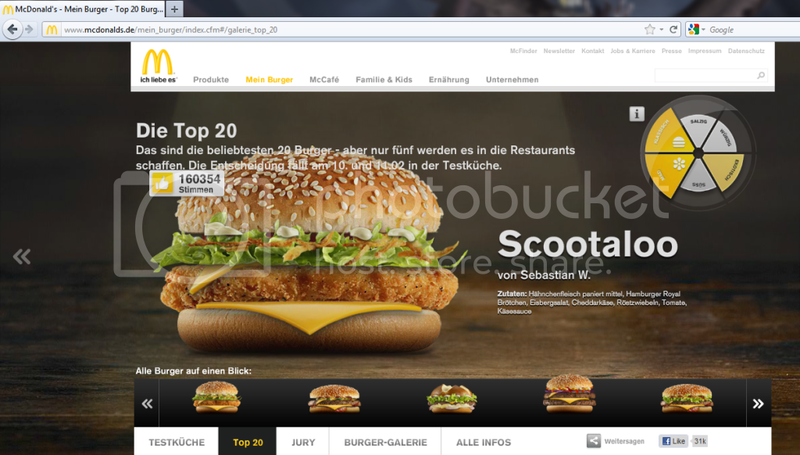 Using a build your own ‘mein burger’ app on the German McDonald’s site people could create their own burger for the contest, where the public could vote. The youtube video link is about the top 20 voted sandwiches being created in the test kitchen with their contestants present. The sandwiches will be given for a jury of 5 judges to pick the top 5 sandwiches which will be sold in stores. After all of the top 5 sandwiches are sold in stores the most popular burger will be named as the winner of the contest. The Scootaloo was created by Sebastian W. and is: Mc Chicken patty, sesame seed bun, leaf lettuce, cheddar cheese, fried onions, tomato slice, and cheese sauce. In my own opinion Sebastian W. is a brony who appears to have thought hard on how to catch Scootaloo’s personality in his sandwich entry. The Mc Chicken patty instead of the New Crispy Chicken Filet, showing how she is regular everyday pegasus. Cheddar Cheese and Fried Onion reflecting her zesty tomboyish personality. Cheese Sauce representing her saucy and zingy attitude. Served like any sandwich you would expect to find in one of Equestria’s Fast Food Restraunts, veggies (tomato and lettuce) on a sesame seed bun. i am disappoint. the only one i would put in my mouth is the mc haudegen.